We flew to Davao for a quick trip last month and had our very first spa experience down south — in K1 Spa along Quimpo Boulevard. We have zero knowledge of a good spa place in Davao. So we thought to just consult the internet and Google map led us to the nearest spa place from where we were staying. 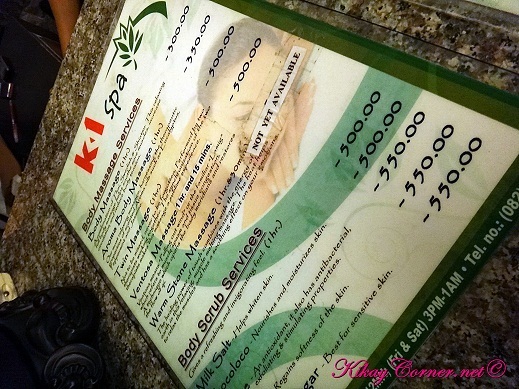 We were in Davao on our Spa day (Monday), so we thought to check out this K1 Spa. We inquired via mobile before heading to the place and had a good first impression of their staff. So off we went. It was a blessing that my FIL allowed us to use his car as we went around the city during our stay. Commuting in a foreign place can be a challenge. The hubby and I availed of Packages 4 (his) and 5 (mine). 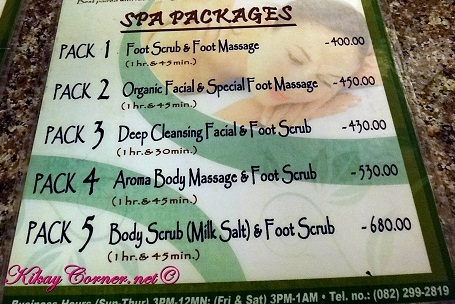 Package 4 is Aroma Body Massage and Foot Scrub for P530. Package 5 is Body Scrub (Milk Salt) and Foot Scrub for P680. Both of which took an hour and 45 minutes. Pretty cheap for spa packages compared to the ones offered across different spa places in Metro Manila.